University of Nottingham were shortlisted for a number of awards at the 2018 BUCS Awards Dinner, hosted at the University of West England. The event celebrated the achievements of a variety of people including student athletes, both individual and teams, who have excelled in their respective sporting endeavours, as well as those volunteers and administrators who have gone above and beyond to progress the sports provision of their institution of sport. The University of Nottingham Sport has excelled across the board once again and to be shortlisted at such an awards is a testament to the hard work and dedication of students, staff and volunteers at the University of Nottingham. The evening, hosted by Sky Sports presenter David Garrido, followed a day where incoming Sport Officer, Emma Hodges, was comprehensively voted onto the National BUCS Sport Officer programme alongside 3 other candidates. This award recognises an institution that has shown the most proactive effort to ensure sport is inclusive and accessible for their students. The Inclusive Sport Officer’s mission is to encourage and support clubs in running inclusive sessions. UoN Sport funded and facilitated an initial inclusive sports day, which engaged over 110 participants – 12% of which had registered disability. With a focus on participants with disabilities, offering a disability referral programme which grants a 50% discount to club membership fees and personalised support. As a result, ten clubs continued to deliver inclusive session, engaging over 400 participants, 15% of which had registered disability – and now have a dedicated student Disability Sport Ambassador to lead their focus. This award recognises an institution that has established a student leadership and development programme. Support the personal and professional development of individuals through sport. UoN’s Leadership Academy deliver and array of initiatives, aimed at developing students’ life skills, and applying them in practical environments. Currently, the programme has over 200 student volunteers, working with 35 school, and engaging with over 1800 juniors. 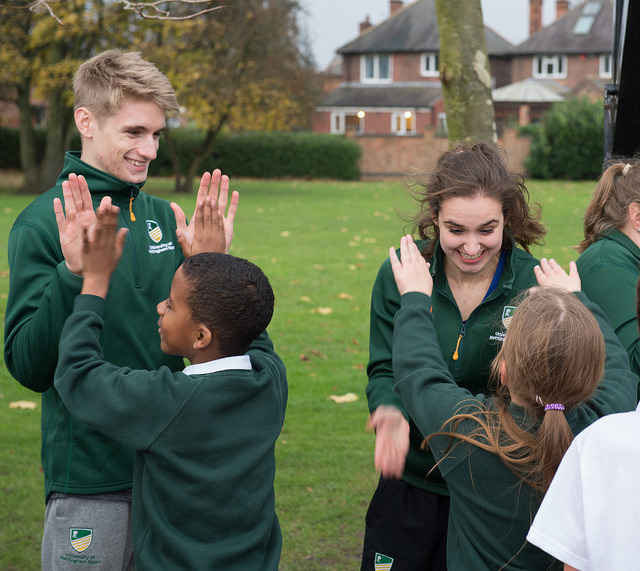 The ‘Leaps to Success’ and ‘Discovery Day’ initiatives aim to raise young people’s aspirations, through visits to the University, or having current students visit and lead PE sessions in schools, and sharing their life experiences with them. Further, the Sport in Schools initiative offers 10 different sports, delivering 12 week sessions of coaching an instruction, upskilling students in their ability to lead and communicate in a different environment. For more information on the Leadership Academy at UoN please click here. This award recognises a club that has demonstrated a commitment to development, inclusion and diversity in its membership. The UoN Tennis Club overhauled their approach, aiming to move away from competitive “trails” of the past, and towards a more inclusive Tennis Open Day. It proved a winning idea, with over 200 students taking part, and the club boasting an 87-member increase. Due to its success, the club has shared their programme idea nationally through the Tennis Foundation National Conference. The club has also formed excellent relationships throughout the community, led by its mission to create a junior club under their badge. This has resulted in members engaging with juniors from the community, and sharing their sporting and academic experiences with the next generation of students. For more information about the UoN Tennis Club please click here. Susie has contributed in a number of ways to the success of the Nottingham Equestrian programme. Whilst being heavily involved with the club itself and the BUCS Equestrian SAG, she has gone above and beyond in her role wit the Riding for the Disabled Association (RDA). She introduced a monthly inclusion session for the RDA, which has seen full attendance for two years running. This session ensures there is a viable pathway for disabled riders to be included in participative and competitive opportunities. She introduced the first ever para-dressage event for disabled riders which continues to grow with 16 riders competing this year. For more information about the Equestrian the the University of Nottingham please click here. This award celebrates the domestic and/or international success of a current female student studying at a BUCS members institution. Maria displayed her incredible talent as a table tennis player this year, and is currently ranking 3rd in England for the sport. This year, she claimed two golds and a silver at the BUCS Table Tennis Championships, and led the Nottingham Women’s Table Tennis to League 1 honors as well as the BUCS Big Wednesday Championship final without dropping a single match. She was selected to represent Team England at the Commonwealth Games in Australia, where she helped secure a bronze medal in the women’s team event. Amazingly, Maria also served as the club president for table tennis at the university while juggling her BUCS, international and academic commitments. For more information about the Performance Table Tennis please click here. Follow all the latest results and latest news from the awards on our Twitter and Facebook pages.